The day before the start of the football season (proper stuff, none of that Premiership malarkey) is the day for unrealistic optimism. That day is today. All things are possible. Your team, whoever it is, is currently unbeaten, unbloodied, unbowed. That may not be the case in 24 hours’ time. Actually, from my last three seasons of watching AFC Wimbledon pretty regularly (I think I’ve missed half a dozen home games) I can report that, more often than not, the first day of the season is a pretty poor guide to how it will all turn out. In Wimbledon’s first game back in the Football League in 2011, we were 2-0 down to Bristol Rovers in about half an hour, and though we rallied we still lost 3-2 and wondered whether promotion to the League only nine years after formation might not have been a step too far. It wasn’t. We were fine almost immediately, third in the table in September, and safe for most of the rest of the season despite a long sequence without a win. The following year, our opening game was on the hottest day of the year against one of the promotion favourites, Chesterfield. It was too warm to run around, and Chesterfield did so even less than we did, so we won 1-0. But then we conceded 11 goals in the next two (away) games, the manager was on the way out and most of the season was spent in the relegation places. We escaped on the last day of the season. So no great predictions for this season, and none tomorrow either after our first game against Shrewsbury Town. But I do have one small request. Last season, in all matches, we scored 49 goals: not a big tally. But of those 49, only seven or eight came in the first half of a match. In fact, aside from the 14th minute goal in the away match at Northampton which I didn’t see, the earliest we scored in any game was the 28th minute. Our opponents seemed to have no such qualms about scoring early in the game, with the result that we were often, even usually, chasing the game after half-time – sometimes exhilaratingly: we came from two goals down to win against both Scunthorpe and Cheltenham, and there were several other victories coming from behind. And it’s not entirely true to say that we failed consistently to score early on in matches. There was hero Jack Midson’s goal in the home game against Exeter; unfortunately, it was an own goal. We won that one coming from behind as well. This season, please, I’d like it to be different. Some of us arrive at the ground quite early so we can get our places on the terrace unobstructed by the giant spectators who can arrive just before kick-off and still get a decent view. We’d like the players to turn up early this season as well: or at least before half-time. We’d like the manager to give his half-time talks, which are patently extremely motivating judged by the second half performances, before kick-off this season, and to make his telling substitutions before the match starts. In short, we’re happy with 41 or 42 second-half goals, but if we had the same number in the first half too, then we’d be in with a shout of promotion. And at this stage of the season, that kind of optimism is what it’s all about. Postscript: Well, it finished 2-2 and, wonder of wonders, AFC Wimbledon scored after 26 minutes, a full two minutes earlier than anything we’d managed last season at home. The manager was very pleased to point that out to the crowd behind the dugout, where I stand. And it was good and entertaining stuff throughout. I think I’m hooked back in again for the new season. I’ll happily watch most sports on television, with the possible exceptions of darts and the circus tomfoolery that is wrestling. I’m a bit more discerning about what I’d pay good money for to go and see live, away from the comfort of my armchair, but I’m a pretty active watcher all told, with around 50 soccer matches a season and maybe half a dozen days at the cricket. Even the odd rugby match. And I got quite excited when the Olympics were in London a couple of years back. The wall-to-wall blanket coverage on the main BBC channel of the current Commonwealth Games, however, is proving slightly too much of a good thing. I know it’s quite important, and if it was in London rather than Glasgow I might go along. But the Olympics it ain’t. And I wonder whether the BBC’s saturation coverage isn’t more to do with the fact that it’s lost most major sporting events to satellite channels than with the Games’ intrinsic merits. Also that it’s in Scotland, and the BBC doesn’t want to be blamed for losing England’s oldest colony in the September independence referendum. Anyway, I’m not watching much of this coverage, but I do want to catch up on the highlights in the TV news. And therein lies a problem. TV news coverage of sports events – soccer excepted – seems to me these days to be less and less about the sport and its news and more and more about the sports news presenters. Instead of showing us 60 seconds of cricket highlights, wickets falling, catches being held, exquisite cover drives and so forth, you get 30 seconds of that and then 30 seconds watching someone called Joe outside the ground give his opinion. Does Joe have devastating insight that justifies this? Or a commanding screen presence? No he does not. Worse still is something I’m inclined to call “the Andy Swiss phenomenon”. Swiss is a sports presenter whose role seems to be, while great sporting events are happening in the background, to “pop up”, in the manner of a meerkat, to offer some anodyne fact-free guff about the event that he can’t see because he’s looking into the camera and you can’t see because the camera is focused on him. It’s maybe unfair to blame it all on Andy Swiss: other presenters are now doing very similar. It looked, yesterday, in the background of the report on the Commonwealth Games marathon, that runners were falling over in the wet, but you couldn’t really tell because some presenter was standing in front of the action telling you it was raining and that she was getting wet. This is rubbish: rubbish coverage of interesting sports events, and rubbish reporting in general. It’s the televisual equivalent of a selfie. It offers no information or insight, except to tell me that some TV news reporters have big ears and big egos, and some TV news editors have no clue about news values nor any regard for the intelligence of their viewers. The job of a reporter, any reporter, is to hold a mirror up to the world; TV reporters can go one step further, and hold up a window for us to look through. This lot are too fond of holding up mirrors and showing us their own reflections in them. I’ve been going to cricket Test matches at Lord’s and The Oval ever since I moved to London, which is more than 40 years now. I’ve seen every single one of the Test-playing countries there and I’ve watched some memorable cricket. But in recent years it’s become more and more difficult to get a ticket. And for this coming season, at Lord’s, it’s impossible. 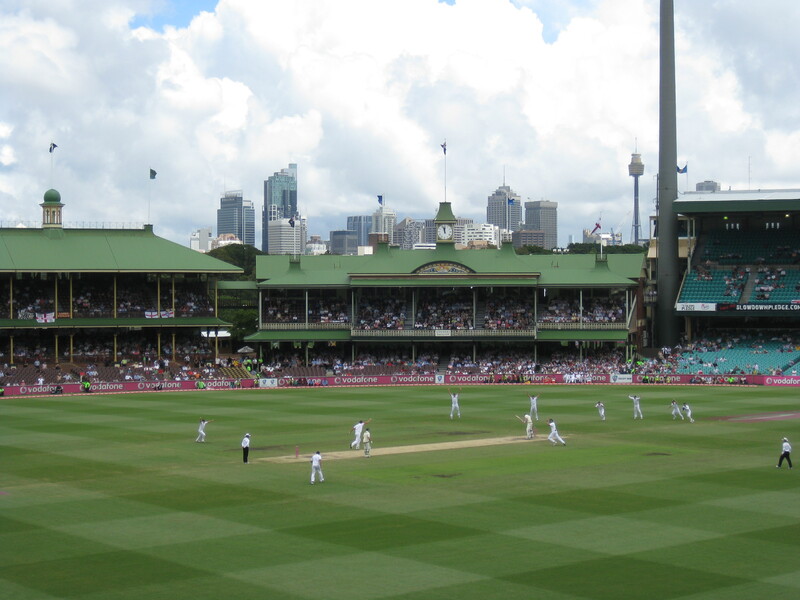 It’s an Ashes season, with the Australians in town, and while I was able to watch all five days of the equivalent game in Sydney on my trip to Australia two years ago, in my own home town it’s no longer possible. Not even a single day. It’s been noticeable at Lord’s over the past few years that long records of watching rather dull games in May against Bangladesh and Zimbabwe count for nothing in terms of getting tickets. The 250 or so of us who watch a County Championship match at Lord’s in late April for £10 better make the most of it. Because if it’s a big match, against the Australians or maybe the South Africans, we ordinary folk hardly ever get in. And the problem? Corporate hospitality and profiteering. Last time the Ashes were in town, 2009, four of us managed, somehow, to squeeze some tickets out of Lord’s for a single damp-ish day towards the back of the Mound stand. There for most of the day we sat entirely alone, surrounded by empty seats. Fleetingly, towards lunchtime, a few bodies came in to sit near us, but pretty soon they departed: they were there for a lunch elsewhere in the ground, with a seat at the cricket thrown in, but the cricket was of no interest. One chap came back in mid-afternoon after lunch and sat near to us: he was, he said, embarrassed that none of his fellow lunch companions were interested in cricket and none intended to return. Lord’s can and will protest that demand far exceeds supply for seats for the premier matches, and I’ve no doubt that they’re right. Some form of ballot for scarce seats is probably inevitable and that’s allegedly what’s been held… though when you’ve been unsuccessful in a ballot, as I and everyone I know appear to have been, you wonder whether it was ever actually held. London’s other big cricket venue, The Oval, is far less opaque in its machinations: I didn’t get the tickets I wanted for there this year either, but I can see that others did. At Lord’s, you see from websites that some people have got tickets. On Viagogo, a reseller site, you can buy tickets for the Ashes Test at Lord’s: seats with a face value of maybe £100 are now on offer for sums between £350 and £700. Charlatans and profiteers seem to have a licence from Lord’s to ply their trade. There are, elsewhere, corporate dining experiences available for £760 a day, with a seat thrown in. I love cricket, and I love watching cricket, but I can’t afford these sums. And nor do I want lunch: I want cricket. Lord’s isn’t interested in whether people who get seats are interested in cricket. It just wants their money. I shall be watching the Lord’s Test from my armchair this summer. I shall be interested to see whether all the stands are full. Next year, when Lord’s will host some presumably “less attractive” Test matches, I’ll probably get in again: my money will be good enough for them again. But this year, it just isn’t cricket. The football season in England is winding to its close, so the opportunity to do as I did last night is running out. Tuesday evening; spent all day in front of a screen; quick drive down the A3 and across the Hog’s Back (where there are roadworks); and then a couple of hours in front of Aldershot Town v Bristol Rovers in League Two. And it was a pleasure. These are two of the better footballing teams in the lower reaches of the English football league, and though the stats may not show it – with only one goal (to Aldershot) and only one corner each – this was a fast and furious and pretty competitive match with both teams trying most of the time to keep the ball on the ground and pass their way forwards. Nice to watch. But there was another reason it was nice to watch as well, and that was not expected when I decided, late afternoon, that a bit of fresh air would be good. For Aldershot Town Football Club was celebrating: it was 20 years, pretty much to the day, since the town’s previous football club, called just “Aldershot” (without the “Town”) had been liquidated. Aldershot FC remains the only Football League club in living memory to disappear entirely mid-season: Accrington Stanley’s demise 30 years earlier is a rather different story and they didn’t liquidate until later. In 1991/92 Aldershot got to about this time in the season and then had to give up as it no longer existed: its previously-played matches were expunged from the records. Among them was a game I remember going to with my mate Geoff, the Scunthorpe fan: a Friday night 0-0 draw with Scunthorpe in front of 1,929 spectators with horizontal sleet throughout. Ah, the good old days. Anyway, last night there was a celebration and, at half time, around 40 of the former Aldershot Football Club’s ex-players, totalling more than 6,000 appearances and 600 goals, were individually called out from the stands and applauded all the way to the centre circle. Few of them, Steve Claridge apart, would be household names in other than Aldershot households and they ranged in age from probably 80 down to mid-40s. All of them seemed genuinely pleased to be there and a bit moved, and the crowd cheered every one of them. There’s a wider point here. More generally in the UK we’re apt to regard business failure as a stigma and something to be avoided in polite conversation. In fact, of course, up to the moment of failure there are usually good things going on too, and why shouldn’t they be remembered? You need to learn the lessons from any failure, but you don’t need to obliterate all the past. Celebrating the liquidation may seem an odd thing to do; but at Aldershot last night it seemed a good thing to have done. I’ve been quiet on here because I’ve been busy, and that’s not changing, so this is a brief and flying visit. But I just wanted to draw a little bit of attention to something that’s gently amusing me while I’m not here: the mess the BBC has got itself into by redesigning its sports news website: www.bbc.co.uk/sport. The corporation irritated quite a lot of people a few months back by redesigning its News website and its own main website; latterly it’s done the weather and now it’s sports’ turn. Of course, as with any change, there will be howls of protest from those who preferred it as it was, and really the BBC can’t win. Except that, in the case of the sports site, it really has done itself no favours. Where the other BBC sites use a rather strange and non-intuitive navigation with headlines in the wrong places but look basically OK, the redesign of the sports site has upped the ante on the navigation woes with some perversely counter-intuitive linkage, and topped that off with an eyeball-mashing colour scheme which makes Yellow Pages look subtle. It’s grim, and quite a few of the pages that a regular sports watcher, like me, would normally want to use have now either disappeared or been “rearranged”. You want to know what football matches are taking place on a particular day? You can’t do that any more. You have to visit each of the different leagues in turn. The constantly updated vidiprinter that shows a feed from the matches taking place has disappeared entirely. As an information source, it’s been ruined. And your eyes will very soon ache from all the yellow. I’m not alone in feeling this way. Right down the bottom of the main sports page, where you’d have to be searching to find it, is a tab that takes you through to the “Editor’s Blog” and when you get there, you’re invited to comment. It’s a testament to the anger that these changes have provoked that around 1250 people have already got there, hidden though it is, and 90% or more of them are there to complain, a lot of them politely, and many of them saying they’ll never use the site again because it’s now so bad and un-user-friendly. Now if you were the BBC would you worry about that kind of response? I’m not sure, because it is of course well-known that change always provokes discontent, and there’s a long record of people getting used to things after a while. What, though, might worry me a bit if I were the BBC is a widespread assumption – in about half the submissions to this comment column – that the BBC will do nothing and that it’s not really run for the benefit of its users. If I were them, I hope I wouldn’t have done what they’ve done, which is to ruin a perfectly usable website. And if I did, I suppose I might think that people would, in time, get used to it. But I think I’d be very uncomfortable with the sheer venom and the hopelessness that these comments demonstrate. You maybe don’t expect to be loved if you’re the BBC. But hated? Not sure I’d be easy about that. It’s almost certainly a computer that comes up with the League football fixture lists for England and Wales, but the rules that it follows are set by people. And many of them are sensible. You don’t, for instance, get cities or areas with two neighbouring and rival teams – Liverpool, Manchester, Bristol, Sheffield, north London etc – playing at home at the same time on League football days. And you try to schedule local derby fixtures and, conversely, matches between far-distant teams – Carlisle v Exeter, for example – with some sensitivity about travel. But sometimes it seems to be arbitrary. And if you look at it through the eyes of the uncommitted football-watcher – ie, me – very arbitrary indeed. I was puzzled, for example, last weekend when I went for the first time ever to see Ipswich Town play at home to spot, a dozen or so miles away from Ipswich, that Colchester United were also playing at home. Of course, neither of them is likely to cause a breach of the peace or vast traffic congestion. But if you’re just a football-watcher from that area, you might perhaps want to go to both. This coming weekend in London is almost the converse of that. There are three Premiership matches, two of them at exactly the same time on Saturday in west London (QPR and Fulham) with the third match, at Arsenal, on Sunday. All right, having three west London sides in the Premiership (with Chelsea) is awkward, and I can’t afford to go to QPR anyway. But it seems strange to put on two games within about three miles of each other at the same time when Sunday is an option. Then lower down the leagues, West Ham are at home and Charlton are playing a top-of-the-table probable-sell-out match against Sheffield United. And that’s it in London. London has three clubs in League Two – AFC Wimbledon, Barnet and Dagenham & Redbridge – and they’re all away. In League One, Brentford and Leyton Orient are away and Championship teams Crystal Palace and Millwall are away too. For good measure, not far out of London, Watford, Stevenage, Crawley and Brighton are all playing away. Wycombe Wanderers are at home, but that is oddly placed when you realise Reading are home as well (all right, Wycombe can’t avoid both Oxford and Reading, so I suppose it has to take its turn). Anyway, the gist of this is that people like me, who like going to football matches but aren’t too bothered about who or where, alternate between almost no choice at all or lots of it. And that seems a bit silly. Computer, sort it out for next season, please.